Meet the ultimate time-saving toolkit for every modern designer. 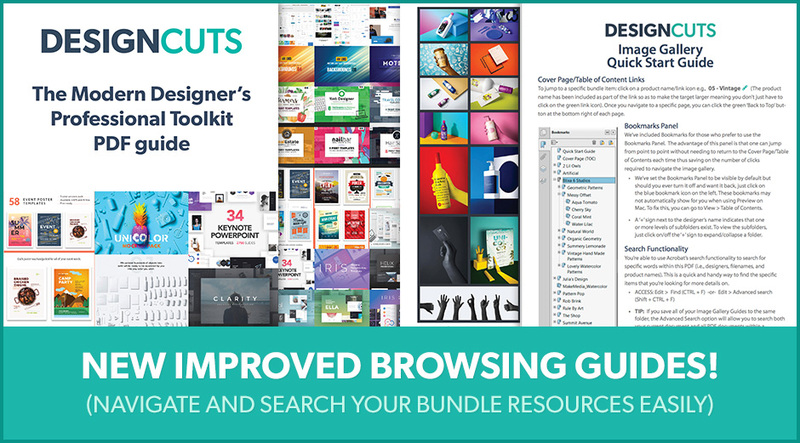 Each best-selling product in this bundle has been designed to help you to get your work done better and faster. There is literally no filler, as we’ve only included the very best products in each category – from stunning mockups and fonts, to sleek print templates and presentation kits. This bundle is bursting with value, and will pay for itself many times over when integrated into your regular projects. There is so much value inside, it’s like a bundle full of bundles! Discover incredible, innovative mockups, a HUGE font family, infographics, stock photos, clean backgrounds, layouting kits, wireframe kits, UI kits, Powerpoint/Keynote templates, icons, illustrations, social media packs, logo kits, pitch packs, flyer templates, and more. 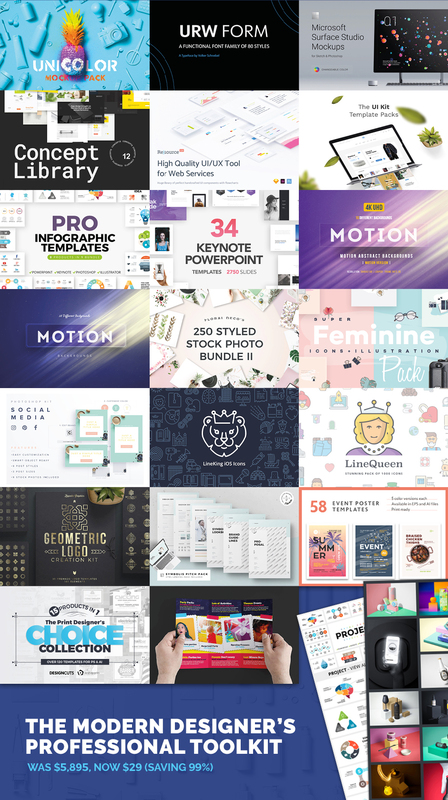 Whether you’re building stunning presentations, websites or branding projects, this pack will save you both time and money. At Mockup Zone we are always thinking about the next best thing. Something unique, practical and beautiful, in fact it is our motto. 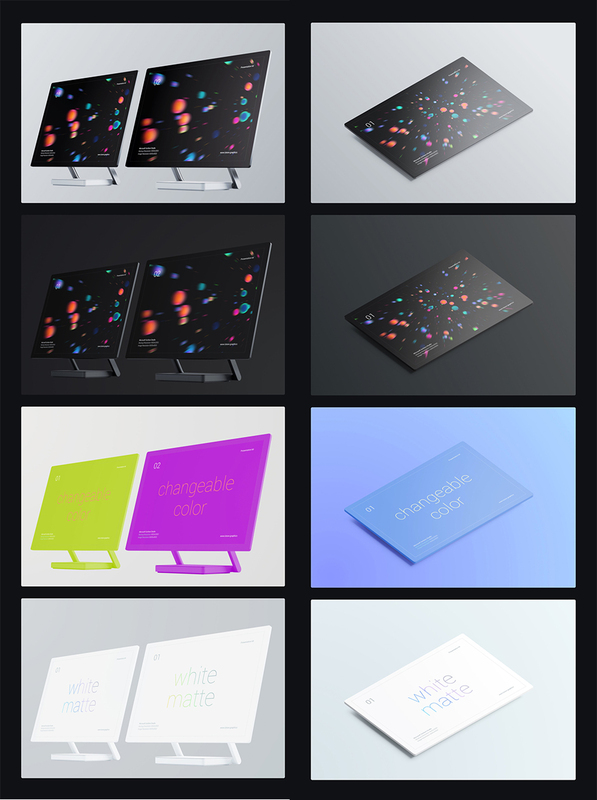 So we created the Unicolor Mockup Pack for you. Basically we got hundreds of real life objects and actually painted them into a single color (of course not those precious Apple products) and then turned them into completely and easily customizable .PSD objects. You can repaint them into any color that you wish, add your own product labels, mix and match and combine the objects and design your beautiful banners like no one else. If you are not a designer, do not worry, we have created tons of templates for you, beautifully designed and ready to be customized with a simple click, go ahead and paint your world into your favorite color. Software compatibility: Adobe Photoshop and Illustrator CC or newer. That’s an amazing mockup set created for a significantly better presentation of your work. Update your portfolio and use it for commercial purposes. We came up with the most needed angles. They present your UI app or website in the best possible light and way. Being aware of how important it is for designers to customise mockups according to their purposes, we created more customisation opportunities. 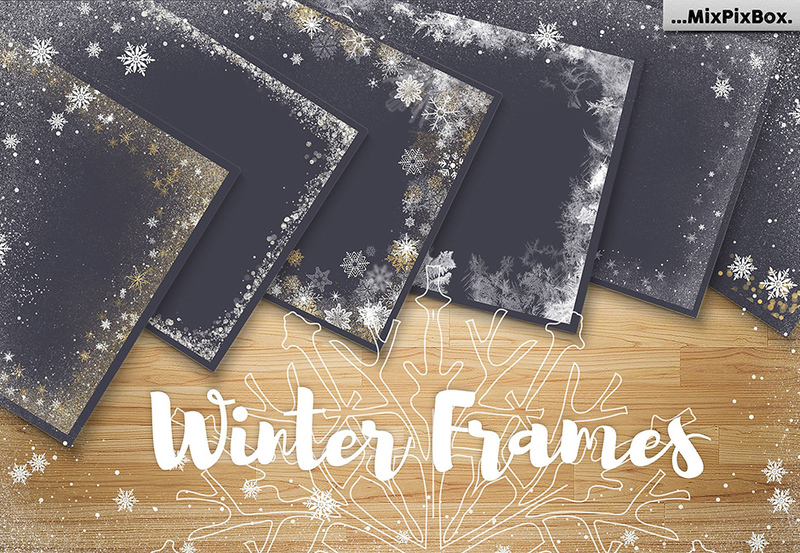 You can find 4 beautiful stylisations – original, matte, white matte, changeable color – in each scene. You can turn off every device or set up the shadow contrast. Mockups are very easy to use, but if something isn’t clear, everything is explained in details in the Help file. Such resolution is suitable for all kinds of tasks. 44 mockups in 11 scenes – in the most useful angles with nothing that won’t come in handy. Software compatibility: Adobe Photoshop CS4 or newer. Also compatible with Sketch 45 or newer. For Web, Interaction, Digital, UI/UX-Designers, Developers and Marketers. Sometimes it takes a lot of time and effort to understand in which direction to go with your work. Wouldn’t it be ever-so-useful to have a library of different concepts at hand any time you need it? So here’s a collection of sites concepts in various styles with templates, style-guides and a huge layout library made to quickly tryout your current project in different concepts. We passed the main stages of concept creation, so that now you only have to customize your current project. It’s much faster and easier than doing it from scratch. Each concept has main templates in 4 most popular categories. The number of elements it consists of is more than enough for the majority of projects. While developing a design you spend most of the time on composition and style. That’s why we created a great number of layouts and a style-guide. Choose a composition that fits your needs best and add your content. The set has 78 layouts and a style guide for each concept. In fact, there are no limits to how you can use it. Huge library of perfect hand-crafted UI components with flowcharts. Software compatibility: Adobe Photoshop CS4 and Adobe XD 0.634 or newer. Also compatible with Sketch 45 or newer. This font includes web versions. Language Support: Afrikaans, Basque, Breton, Catalan, Danish, Dutch, English, Finnish, French, Gaelic (Irish, Scots), German, Icelandic, Indonesian, Irish, Italian, Norwegian, Portuguese, Polish, Saami (Southern), Spanish, Swahili, Swedish. 34 professional templates for Keynote and Microsoft Powerpoint. • Powerful layouts, proven to work in the real world. • Modern Slides so it looks good on screen or projected. Please note that the default format is 16:9 Ratio Display, therefore some distortion may occur when re-sizing to 4:3 Ratio Display. At Mockup Zone we are always thinking about the next best thing. 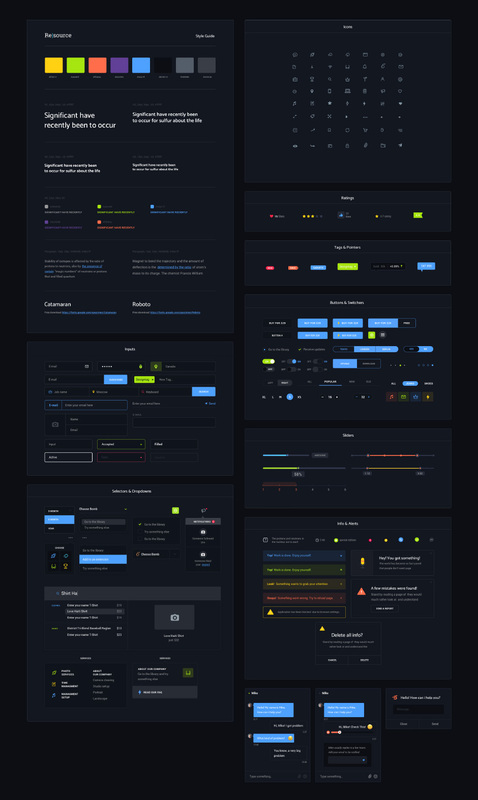 Something unique, practical and beautiful, in fact it is our Nitro – Multipurpose Web UI Kit included are 200+ UI Cards in 8 categories based on Bootstrap 1170px grid make your design process super easy and fast. So you can easily change Drag and drop cards, customize, replace images and texts. 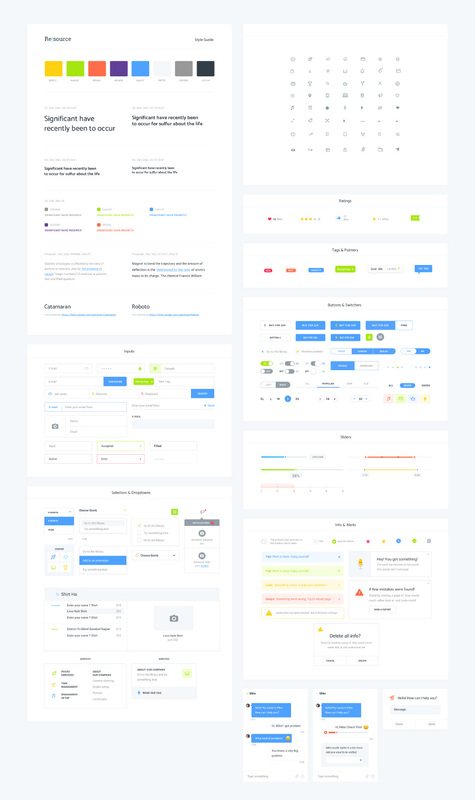 Be Pro UI Kit for all your Ecommerce needs. Be Pro is compatible with both Photoshop and Illustrator, so you can design at your preference! It contains design elements that simplify the creation of your website or prototype. With it, you can easily create an online store and much more! 10 unique looped moving abstract backgrounds. These motion backgrounds are great to showcase your products, motion graphic presentations, advertising, logo intros, banners, TV ads, and video loop backgrounds for websites. These videos come in .MP4 format, that can be edited frame by frame in Adobe Photoshop CS6 and newer, and most video editing software such as Adobe Premiere, After Effects and Final Cut Pro. Please note: You may need to convert the .MP4 to another file format to use in other video editing software. Great for web design or graphic design; includes 18 .JPG files of different backgrounds. • ZIP archive with 250 sRGB .JPG format digital images. • 193 Landscape (3:2) and 57 Portrait (2:3) images. • Dimension is 3960×2640 (10.5mp) for Landscape images. • Dimension is 2448×3264 (8.0mp) for Portrait images. 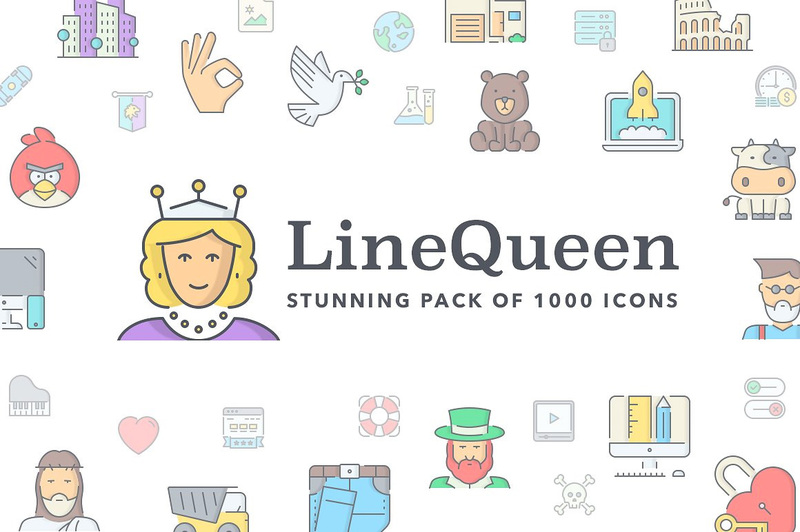 Lovely collection of 120 icons that are specially curated for styled stock photographers, designers, bloggers, digital influencers and creative freelancers! This set contains all the favorite subjects in styled stock photography including the all-present peony flowers, cacti, succulents, monstera plants, smartphones, notebooks, fashion accessories etc. Icons are provided as vectors, rasters and .SVGs which makes them ideal for both print purposes and for websites, apps, social media marketing and blog posts. A collection of 50 illustrated Instagram templates are also included in five color palettes: Pink, Blue, Coral Orange, Beige and Black and White. These lovely modern sets will be awesome for female bloggers, designers and photographers! You can use them as Instagram posts, web or blog illustrations and you can also print them without any loss in quality. Software compatibility: Adobe Illustrator 10 or newer. LineKing springs out as a result of many months of experimentation and trial and error, in order to bring out the best visual metaphors. Ideally, the icons should blend so well into your next project, as if they’re custom-designed for you. When I say 1000 icons, I really mean it. No silly repetition, no kidding. They are all categorized into 50 collections, each consisting of exactly 20 symbols, focused on specific niches or industries. What Makes Line King Different? • Strong Metaphors. 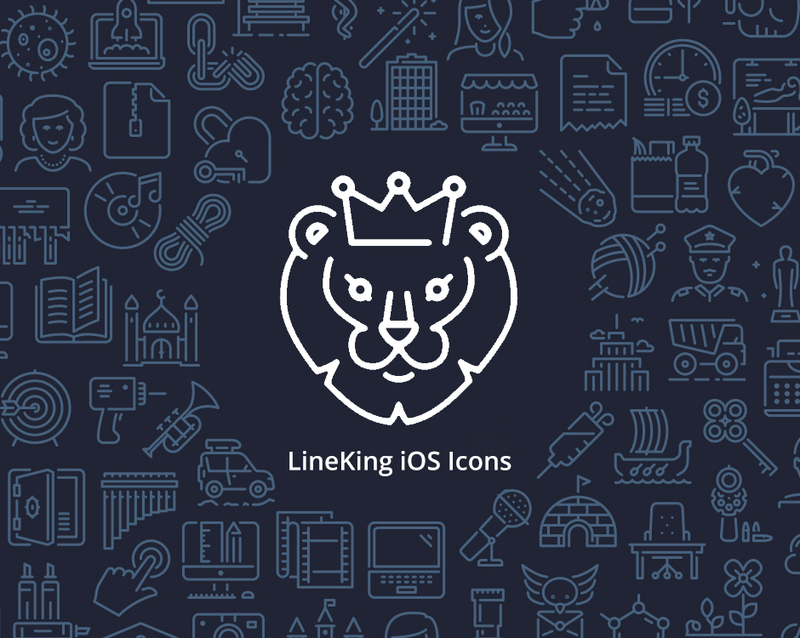 LineKing strives to avoid general-looking overused symbols and when logical, come up with unique visual metaphors. • Quality Over Quantity. No race for the biggest icon-set. The real challenge is to craft all icons unique in shape and character, without unnecessary repetitions. • Open-line Style. Leaving the lines open, when done properly, sets a different mood for each icon and is easily distinguished from the other line icon sets. • Thickness Control. All icons are designed in a way that you can control the thickness of the stroke with only a change in number. • Ultra Consistency. Level of details, perspective, mood, curve radius… All icons share these attributes equally, making them a one cohesive icon-set. This is really important folks! • Infinite Scalability. This goes without saying. All icons are designed as vectors, therefore they can be limitlessly scaled and work great at any size. • iOS Optimized. Oh, and did I mentioned they are iOS optimized? All icons are crafted upon a grid of 60×60 pixels, making them blend perfectly into your iOS app. Software compatibility: Adobe Illustrator CS6 and newer. Sketch 3 and newer. .PNG and .SVG files will work with most graphic software. As a successor of LineKing, LineQueen is the better half, the feminine one, the one who makes full use of lines and colors in order to establish a style which is classy, elegant and meek. The icons collection consists 1000 unique symbols. No repetitions, no kidding! Each icon is crafted with the intention to be used as a different visual metaphor. You’ll get various file formats. The original illustrator file with stroke control, as well as an outlined version, but without the shadow. Sketch lovers, you get a Sketch file with defined shared styles for the stroke, shadow and color palette, which makes change a breeze. For the lazy ones, you get 3 sizes exported in .PNG format (60×60, 120×120 & 240×240 pixels) and an .SVG version. • Rich in Details. Each icon contains just enough details to look stunning at small, medium and big sizes. • Strong Visuals. Each icon tells a different story, with the aim to come up with icons as if they’re custom-designed. • Ultra Consistency. All icons share a common visual language, such as curve radius, perspective, mood, colors, shadow direction etc. • Line Thickness Control. The Illustrator and Sketch files give you full control over the stroke weight. • Color Customization. Ability to adjust the color palette. The use of shared styles in Sketch makes this a breeze. • Infinite Scalability. This goes without saying. All icons are vectors, so there is no size limit. Yes, big enough even for a highway billboard. Software compatibility: Adobe Illustrator CS6 or newer. Sketch 3 and newer. .PNG and .SVG files will work with most graphic software. As part of our bestseller Logo Creation Kit series that includes the first and the original logo creation kit, we are happy to present the newest logo kit featuring over 180 elements, 35 pre-made logos and a lot of styles, swatches and .JPG gold textures! 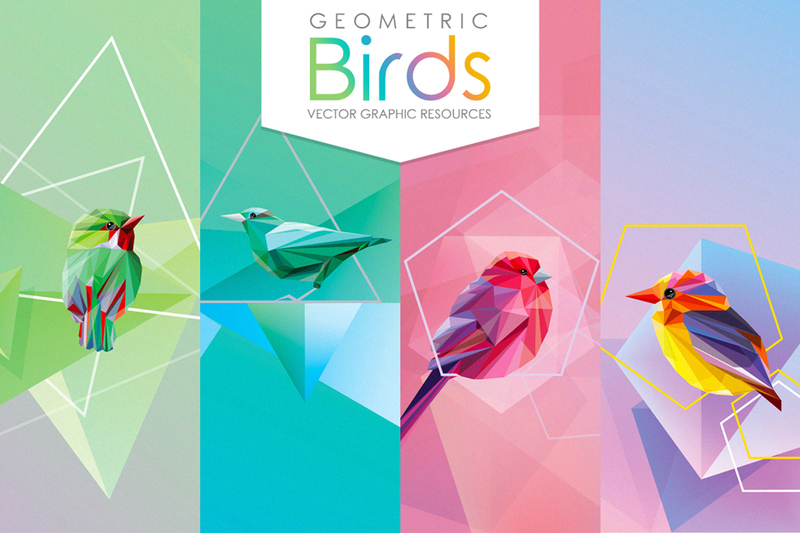 We used Arabian geometry as inspiration when we created these amazing vector elements and logos! We have also included video tutorials to guide you if needed! Software compatibility: Adobe Photoshop and Illustrator CS1 or newer. .EPS files will work with a variety of programs such as Adobe Photoshop or Illustrator, Sketch, InkScape, Affinity, Corel Draw, etc. .JPG files will work with most graphic software. 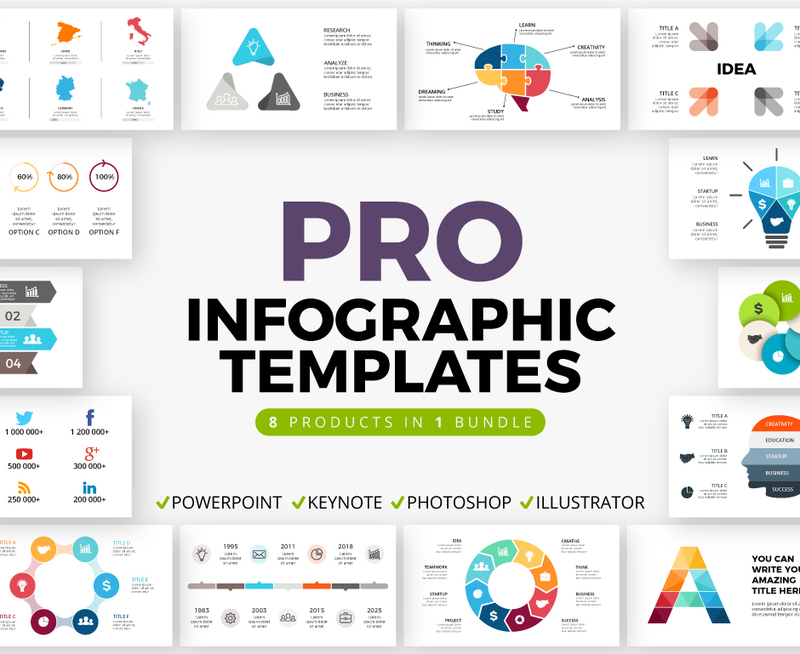 It is the most diverse Infographics pack available and contains 8 super high quality and versatile infographic collections. Every file is absolutely easy to edit in the software of your choice: Powerpoint, Keynote, Photoshop or Illustrator. • All objects are supplied in .PPT, .PPTX and .KEY files. PowerPoint and Keynote vector shapes are simple infographics and transparent .PNGs with editable text, numbers and icons with gradients and hard shadows. • All objects are also supplied in .PSD, .EPS and .AI files which are fully editable, well-organized and grouped. • Only free fonts used (Open Sans, PT Sans, and Montserrat. Software compatibility: Adobe Photoshop and Illustrator CS1 and newer. .EPS files will work with a variety of programs such as Adobe Photoshop or Illustrator, Sketch, Affinity, Corel Draw, etc. .JPG and .PNG files will work with most graphic software. Also includes files for Keynote, PowerPoint and PowerPoint Open Source. Get your clients with the Symbolis Pitch Pack! 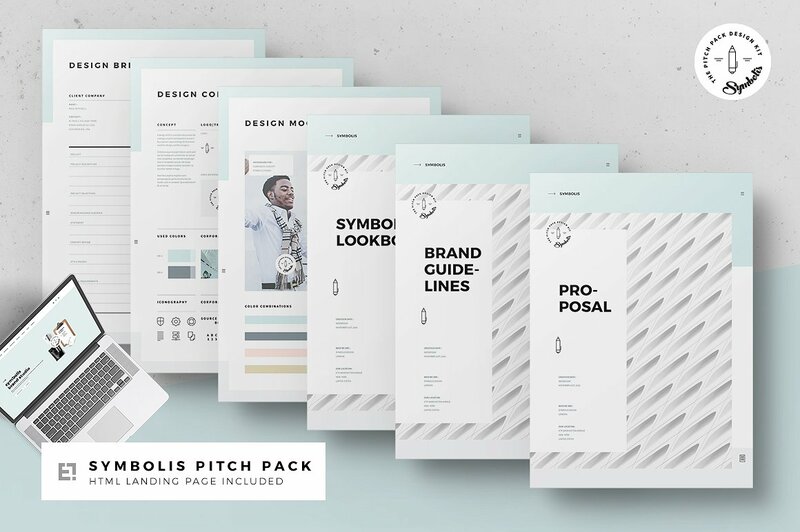 This pitch pack consists of 24 Adobe InDesign templates to cover your client interactions from the introduction (covering letter and resume), to pitching (briefing, proposals and quotation/estimation), to design (mood and concept design sheets) and finally through to billing (invoice). An absolutely stunning additional feature is the included; a Landing Page to bring your company into the web. It comes with an awesome header, animated charts, slider carousel, working contact and newsletter registration form (PHP or MailChimp) and many more features you need to have. See a website preview here. The preview images are shown in light blue and grey but it is easy to change the colors to your brand colors through the color palette (changing colors with only one click through the document). The package includes files for CS4 to CC2015 (and above) versions of Adobe InDesign. All the elements in the design such as text, colours, styles and images can be easily edited. Software compatibility: Adobe InDesign CS4 or newer. • 5 color versions included in most posters. Software compatibility: Adobe Illustrator CS2 or newer. At BrandPacks, we pride ourselves on creating easy-to-use print templates that designers actually want to use. 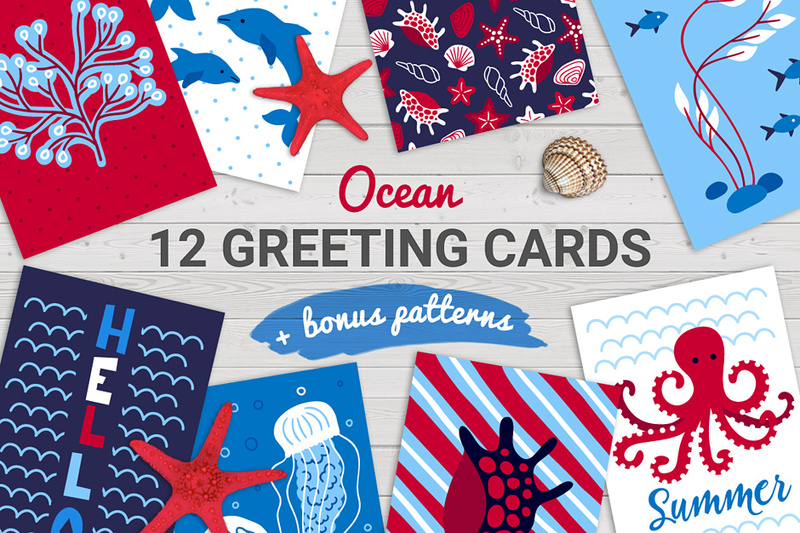 In The Print Designer’s Choice Collection, we have cherry-picked 15 of our top-selling items for a variety of industries and combined them into one incredible bundle deal. In this one pack you get access to over 120 professional-grade templates for Photoshop & Illustrator. Each template also comes with royalty free stock photos included as standard, and only free-to-use fonts are used throughout. From farmers markets and gardening services to local plumbers and electricians; this bundle of ready-made templates provides a priceless set of resources for your next design project. 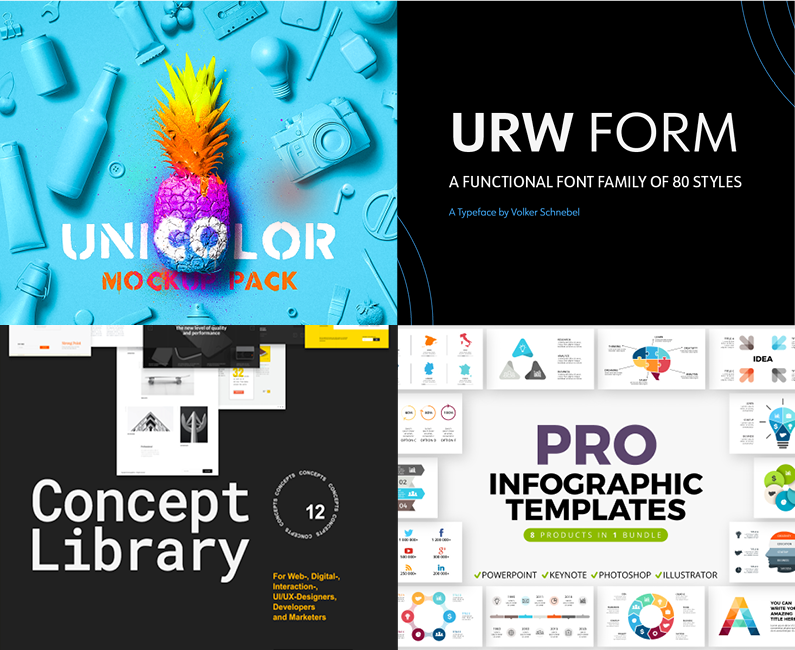 This bundle contains a huge amount of modern, professional resources, including a huge corporate font family, professional mockups templates, infographics, branding and print templates, icons, and modern backgrounds, perfect for any graphic designer and freelancer. We've focused on quality and usefulness with this bundle. These items are already hugely popular at full price. This is an exclusive chance to own this toolkit of professional resources for this kind of price. Deal includes extended licensing (please see above for more details). File size is approx 27.34 GB (split into 4 complete downloads and 25 smaller parts) for easier download. So much in here it is incredible! I keep coming back to it to use elements and every time, there is a smile on my face 🙂 Thank you so muc for putting all your thought, expertise and design skills into this. It has helped me a lot already and will do more in the future – what a great Easter Egg! I saw a link that says that this was a Black Friday promotion and when I click it it says that it already expired!! 🙁 Is there anyway I can get it? Thanks for reaching out to us about this and this is very strange as we haven’t started our Black Friday promotions yet- they will start at the end of the week though! Would you mind sending me over the link that you clicked on so I can check this out for you? This bundle was initially on offer in April 2016 so it has been expired for quite a long time now and we actually don’t re- run any of our bundles anymore so I can’t get you set up with this one. I am so sorry to disappoint you Geovanny. I hope this helps and if you have any other questions, please do get in touch. I’m always happy to help! Sadly enough I missed this bundle. It’s like the number one bundle that I really needed. Is there something we can do? I just missed it…!! I am really sorry, but this bundle expired in September so we aren’t able to make any exceptions now I am afraid! I’m so sorry I just missed this! Is there any chance I can still grab this great bundle? We’re so sorry to hear this! Hello!!! Oh my god!!! the bundle I wanted to buy expired, it was my mistake with the difference of hours between Mexico City and England! Do you think it would available any time later? I love it! Oh no, sorry that you missed this Pilar! I am a newbie here and also have CS6. I especially wanted this bundle because of Mockup World’s Unicolor offering. I downloaded samples from their website so I could experiment on my computer. I have a little experience with smart filters and mock-ups in Photoshop and not even rudimentary skills with Illustrator, yet I was able to create these wonderful images! I resized the images to 600 ppi so you can see the details. I made sure to save iterations as a precaution. And when I received prompts, I’d keep my fingers crossed as I clicked OK :). Everything turned out fine and I just purchased the bundle. Thanks so much for letting us know Loretta! Aww thanks so much for the awesome feedback and your purchase John! 😀 we’re glad you are Ludovic! Like one of your other customers said…lots of scrolling, like this, like that…not sure if I need this…then I stumble across a couple of things that I’m like…yeah, OK…think I need that. Keep going…oh crap…there’s more that I need. Then you resign yourself to the fact that it’s better to just accept DC will always get you in the end and pretty much every bundle has a load of resources that will just change the way you work. Damn you DC…damn you all!! Of course in the nicest possible way! Ha-ha we’re so sorry Daniel! Awesome bundle as always….wasn’t too sure about getting this one, but I am so happy to see more feminine style elements included. The stock photo bundle is gorgeous, there icons are sooo cute, the motion web backgrounds are a must! Off to hit the buy button and add to my collection. Aww thank you so much- we’re so glad you like this one! I found out that most of the files don’t match with my workplace’s softwares. GIMP, InDesign, some files I would have liked to use in Illustrator also. The Bundle was really exciting and I was expecting to find my paradise but I guess I am unlucky today. I would like to be refunded if you don’t mind, please. I still believe this website is really amazing though. I’ll recommend it. I am so sorry to hear you are not 100% happy with your new design bundle. We always offer a full refund within 30 days of your order if you are unhappy with your purchase and I can certainly get this organised for you. I am still newbie at designing but I already bought without looking at the whole package. This is a great package! thank you! You guys are amazing! cheers! Thank you so much for your comment and we are so pleased that you like this one and made it your 12th bundle! Thank you so much Maamoun 🙂 We are so pleased you like it! Thanks for the comment and sorry to hear your system had some issues with space. A lot of our community use external hard drives when it comes to their downloads so another option to consider! Thanks for the feedback as well on our latest bundle- we totally appreciate that not every bundle will suit everyone but we always hope that there will be something for everyone! Please always let us know if there are any resources you would like us to try and feature for you in a future bundle! Hello! Yet another great bundle! I just have a small question: I noticed that for the BrandPacks – Part 2, the folder Kids Party Template only contains the A3 template. Shouldn’t have been more sizes for this pack as well, like the other ones have? And in the images preview I see there’s also a trifold, and it says ‘8 templates’ but it’s just the one. Maybe I’m missing something? Thanks so much for the comment on this one! Oh no, I am so sorry that you are having an issue accessing all of your Kids Party Template pack- I have popped you over an email to get a bit more info from you about what is happening for you and rest assured, we shall get to the bottom of this for you :). Thanks for the comment and that doesn’t sound crazy at all- a lot of our community do the exact same :). Not only have you ticked off an item from your wish list but you also got everything else in the bundle as well and hopefully you will find good use for the rest of your new extras! This is so amazing. I got tired of scrolling. Lol. It kept on coming, more and more value. Seriously guys, how can you top this? Thanks so much for the comment on this one- it definitely made us giggle over here! I will definitely pass on your feedback to Marco as he will be delighted to hear you liked the video! 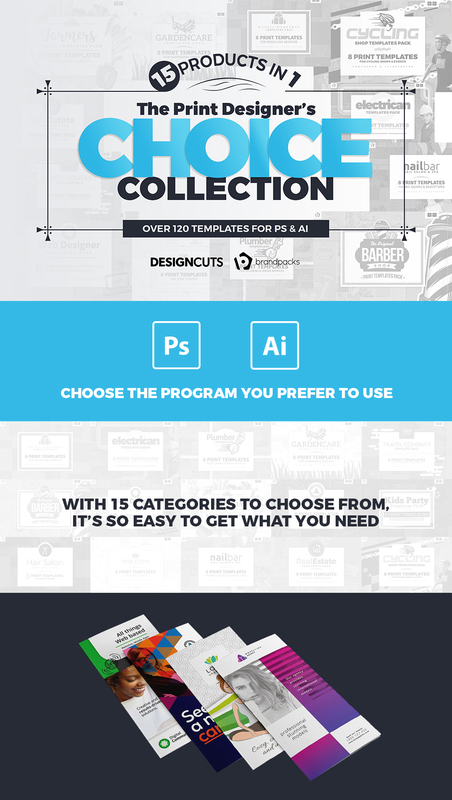 If I were more in to web design, this bundle would be right up my alley! LOL But, alas, I am not a web designer – yet! I just wanted to say I am pleased to see some stock photos in this bundle. Though, these aren’t exactly what I am looking for, it’s a start. The kind of Photos I think would be helpful is backgrounds, with images, scenes, etc. I think effects images go a long way, such as powders or paint splashes. To just say, “Stock’, really doesn’t help, I realize. And, there are plenty of good stock sites out there. But, good effects to enhance images or artwork, or, as a starting point, say, in a photo-manip, could be very versatile. Thank you so much for all ya’ll do! This is also some awesome feedback with regards to the stock photos and i’ll definitely pass that onto our Product Team so they know what to keep an eye open for next time! uggggh another great bundle! I thought I’m gonna skip this but wth, take my money! am a new designer starting off my creative carrier and this is just so cool for the journey, i can’t but resist that last 24 dollars in my account, cant wait to save some more dollars to purchase this..thanks to the great team…. Thanks for the awesome comment and congrats on starting your design journey- welcome to the DC community! The team here are always free for a chat if you ever need help with any of your work! I can´t believed it never ends, theres always something else to show us. Thank you very much for your amazing work. Aww thank you so much Virginia! Other than that seems a really cool and lovely package again! Oh awesome, thank you so much for letting us know! Just to make sure: URW Form does not include a webfont license, does it? Just wanted to put my vote in for compatibility with older versions of Photoshop. A lot of these bundles have great stuff in them, but as a user of CS6 who isn’t really in a position to upgrade to CC right now, I’m not able to make use of many things that come included, unfortunately. Thank you for raising it with the designers. Thanks so much for the comment and rest assured we take everyone’s feedback on board. We totally hear you about the increase in compatibility but a lot of our designers are working in CC these days. However we will always try and have a broad spectrum where we can and try and get designers to consider legacy versions, where they can so that our entire community can benefit from the resources :). Hey guys! This pack rocks, so couldn’t pass it up. I’ve always got my gaze cast toward Design Cuts for awesomeness…. And my eyes haven’t betrayed me yet. Thank you though, for all the support, we really appreciate it! *SO* very sold! Thank you! I keep scrolling through and finding more and more amazing things, although to be honest I was already convinced by a few photos into the Unicolour items. Fantastic! Thank you so much for your comment and email on this! Me: Don’t need this, don’t need that. Looks awesome, but I’m gonna skip this bundle. Me: Omg, that’s so cool – I must have this bundle. This pretty much sums up my interaction with most DC deals. You guys are amazing. Oh thank you for taking the time to leave us such a lovely comment! I just told my wife that I am leaving her … for this bundle. This bundle and I are going to make a life together. She just laughed at me (she is a designer, as well). I can’t say enough about this incredible deal. I hope no one else in the world sees it, so it can be all mine. 😂😂😂 thank you so much for the brilliant comment! The team and I absolutely love this, however we cannot be held responsible for any fallout your separation will bring ha-ha! Hello and thank you for another great bundle. Maybe open like once a month the possibility for people to buy the old ones… so many things I would like to have are in several past bundles. Thank you for these great assets. You might want to consider implementing lazy loading for the images. Sometimes you land on the bundle page and it’s not necessary to load all 100 MB. It delays the ability to navigate your website. Just a thought. AMAZING AGAIN!!! Thanks so much for always show and give us the great stuffs. So wonderful! Each time you have the new one I dare not but could not resist to have a look and then .. ready to pay. Thanks again! Check out soon! Oh you are so welcome, we were super excited to share this one with you so I am really glad that you like it! Thank you so much as always for taking the time to leave us such an awesome first comment on the deal page! Your super kind words of course mean the world to the whole team and I and we cannot thank you enough for your continued support.